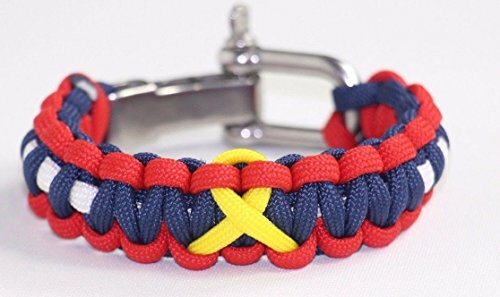 This Paracord Bracelet with Yellow Awareness Ribbon (often called a Survival Bracelet), is made using military spec 550 parachute cord that can be unraveled in an emergency and used in many lifesaving applications. Often used as a general purpose utility cord by both military personnel and civilians. Each paracord bracelet comes in its own individual poly bag. Stainless Steel Adjustable Shackle Adjusts From 7.5" to 8.25"
If you have any questions about this product by Txdeals4u, contact us by completing and submitting the form below. If you are looking for a specif part number, please include it with your message.